Profiles API enables you to dynamically change your content based on detailed customer information. 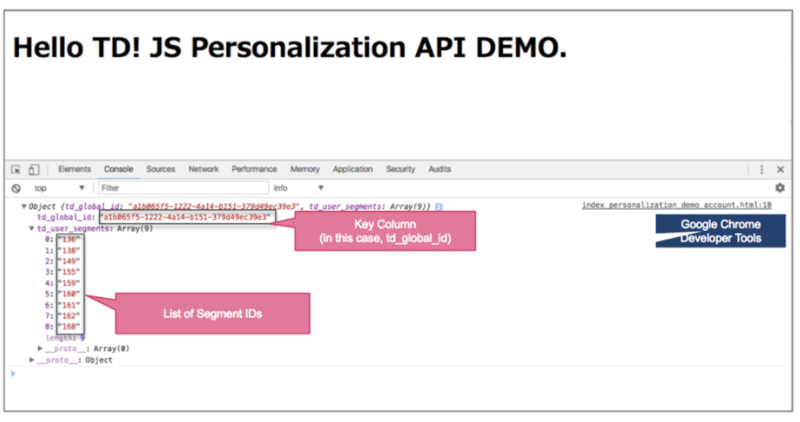 This REST API returns customer data in real-time and updates your segment information. By default they are created using a V2 token. You can use Profiles API to personalize your customers experience on your website. You can combine Treasure Data’s personalization feature with A/B Testing tools such as Adobe Target, Optimizely, Google Optimize, to determine the version of your website that yields results. When the underlying personalization workflow completes, the personalization data set is refreshed. You can see a current list of the segments to which a specific profile belongs. And, with API token V2, you can also see a list of attributes associated with the specific profile. The master segment must already exist in Master Segments. The master segment is the basis for all data accessed by Profiles API Tokens. Navigate to Audience Studio > Profiles API Tokens. Note: Use Profiles Token V2. If you have used the V1 API tokens, you must complete migration steps to apply the V2 token to segments at are specified in your existing API token configurations. Complete the fields to configure the API token, including specifying a key column and the segments of customers to which you want to apply personalization. Use Add Segment to associate the profile API with one or more segments. This is necessary to personalize your content for that segment. With this defined, for example, your customers that like dogs will see web page content for dogs instead of content for cats. Here’s the example output with Google Chrome Developer Tools.